What Is the Big Bear Turkey Trot? Thanksgiving dinner is undeniably delicious, and it is the cause of many waistline woes each year. This year, you can have the proverbial turkey and eat it too by attending the Big Bear Turkey Trot on Thanksgiving morning. And, if you are looking for other festive events, download our complimentary Vacation Guide for local recommendations for all the best seasonal activities! The annual Big Bear Turkey Trot is a family-friendly event on Thanksgiving Day that centers around a series of races. Participants may enter the 3-mile, 6-mile, or 9-mile race. Also known as the Thanksgiving Day Fun Run, this festive event is a fundraiser that benefits Open Air Big Bear, the Kodiak Kids Trail Runs, and the Big Bear Community Church Food Pantry. The first 350 people to register are guaranteed an event shirt as well as an event ornament. There are prizes for the fastest runners in each race, but don’t let that intimidate you! Participants can walk, trot, and even push kids in strollers for the length of the track. Attendees are encouraged to come in their finest turkey, bear, or autumn costumes, and the best participant costumes will also receive prizes (as well as bragging rights). The Big Bear Turkey Trot takes place Thanksgiving morning at Meadow Park. This location on the shores of Big Bear Lake makes for an event that is as scenic as it is fun. You can register to participate in any of the races online or in person on the day of the event. Online registration closes at midnight on November 20th and discounted early bird tickets are on sale until November 15th. This event is pet-friendly, provided that they are leashed and properly vaccinated. Big Bear Lakefront Cabins offer luxurious retreats in the best areas of Big Bear. Whether you want to spend your vacation in a lakefront cabin or curl up in a cabin with ski slope views, you can expect quality lodging. Our properties feature fantastic amenities like hot tubs, spacious kitchens, and incredible views. Relax your muscles after the race in an outdoor hot tub that has spectacular views of the surrounding scenery and mountains. Our Wild Burro cabin features open, airy rooms that have vaulted ceilings and natural stone and woodwork. Skylights and numerous windows let in plenty of natural light and allow for unobstructed views. You might even catch a glimpse of a herd of wild burros, which is where this cabin gets its name! 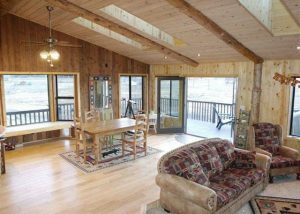 The Wild Burro provides you with seclusion while still being close to town, the lake, and the ski slopes. We have several other fantastic cabin rentals available, so be sure to look through all of them before you book your stay in Big Bear Lake!